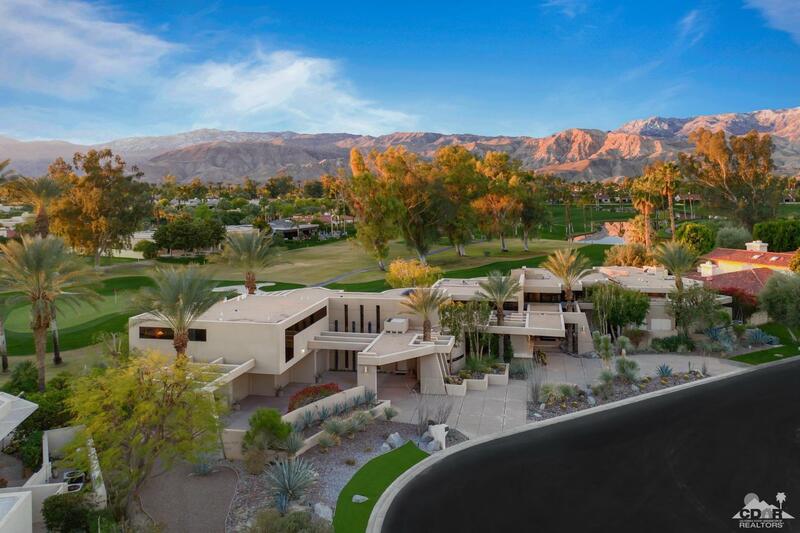 Spectacular Guy Dreier Contemporary Property with South Facing Multiple Fairway and Mountain Views and Expansive Palmer Course Frontage. Located in privately gated Muirfield Estates with Great Curb Appeal and Circular Drive. Dramatic Interiors with high ceilings, walls of glass and classic Dreier angles and curves. Open Great Room with fireplace, entertainer's bar, dining with views, media room and gourmet kitchen. Master Suite wing includes bedroom with fireplace, spa bath with waterfall granite, sauna and gym. Guest wing includes guest living room and 4 guest bedrooms (or 3 and an office) each with ensuite bath and views. Pocket sliders open up for indoor/outdoor living with a resort backyard including Swimmer's Pool, Spa, Multiple Waterfalls and streams, Outdoor Shower, Travertine Terrace and Outdoor Kitchen all with stunning south facing mountain and fairway views. All the very best - this unique offering is one of the most outstanding homes on the market and priced to sell!